The hand prints on the rock in front of me are almost ghostly, the pale palms and fingers defined by a spray of deep red ochre on stone. 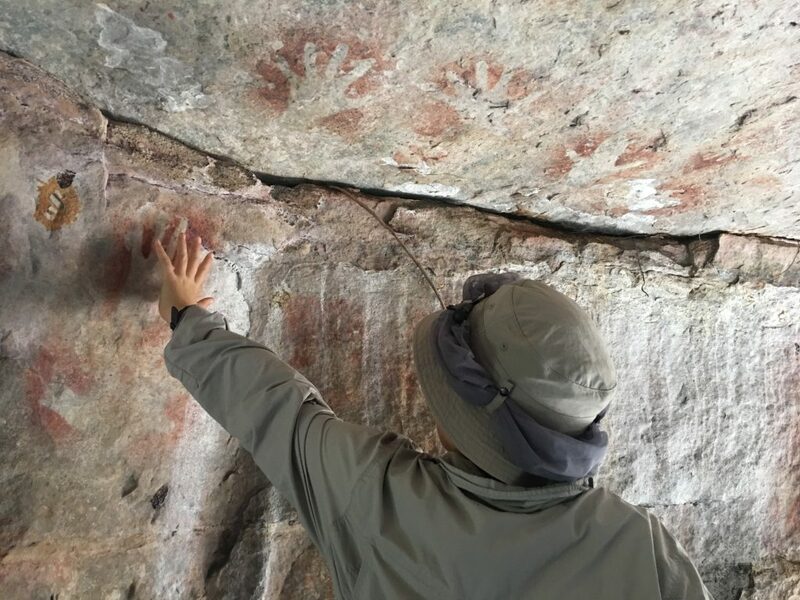 There are various explanations for the presence of these hand prints which are tens of thousands of years old. My favourite is that they are the signatures of people who had a special association with the place. They might have been a significant visitor, or someone who had returned home after hunting or initiation activities. We’ll never know for sure. What we do know is that they are evidence of connection and reconnection over millennia of the traditional owners with their land. 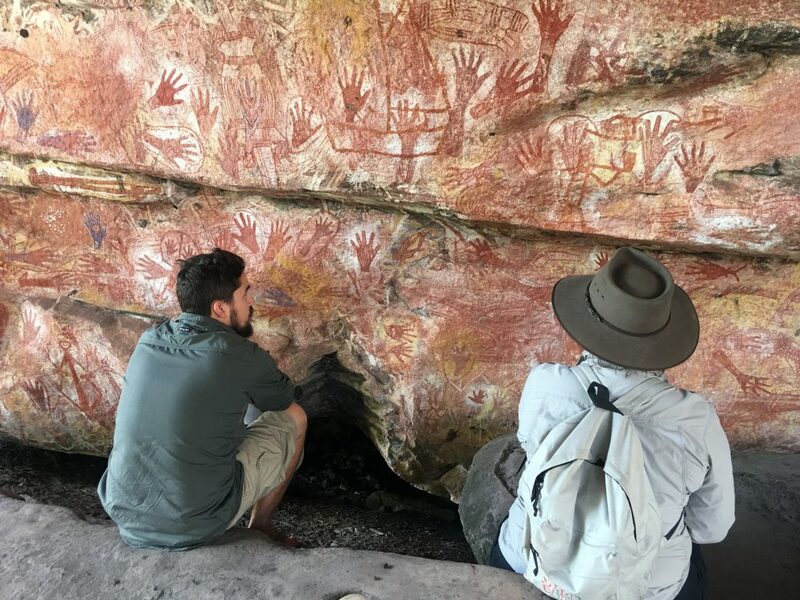 We are exploring the astounding rock paintings at Davidson’s Arnhemland Safaris, a private camp on sacred country not far from Kakadu. The extent and quality of this exceptionally well-preserved rock art, some of which is thought to be around 50,000 years old, is unrivalled anywhere in the world. We see many different hand prints, both stencilled and painted, some decorated with dots and cross hatching, others with outlined “frames”. We also see simple stick figures with boomerangs and spears, animals and birds, people, contact era objects and mythical beings. The significance of the rock art, and our ability to get up close and personal with it, is not lost on me. During the same trip we also see what are regarded as Kakadu’s finest rock paintings at Ubirr. They are impressive but not a patch on what we see at Davidson’s. At Kakadu we are behind barriers, sharing the moment with scores of other tourists. Here we have it to ourselves. 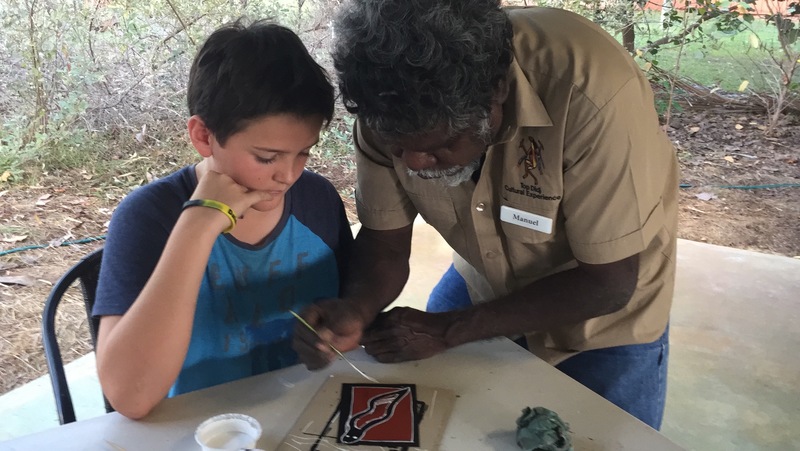 The impetus for our Top End adventure was for our kids, Archie, 12, and Lulu, 10, to learn more about Australia’s ancient culture. They’ve been fortunate to have travelled widely, in a global sense, but they’ve experienced relatively little in the way of indigenous history and culture in our own backyard. Redressing that imbalance was long overdue. We’re following a relatively well-worn tourist path from Darwin to Kakadu, Katherine, Nitmiluk National Park and Litchfield National Park, with a two-day foray into Arnhemland. 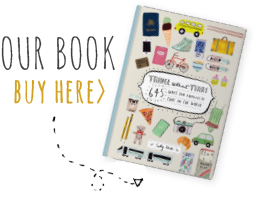 Northern Territory Tourism promotes the route (minus Arnhemland) as Nature’s Way, a road trip that’s ideal to do over a week or ten days, although you could spend much longer. 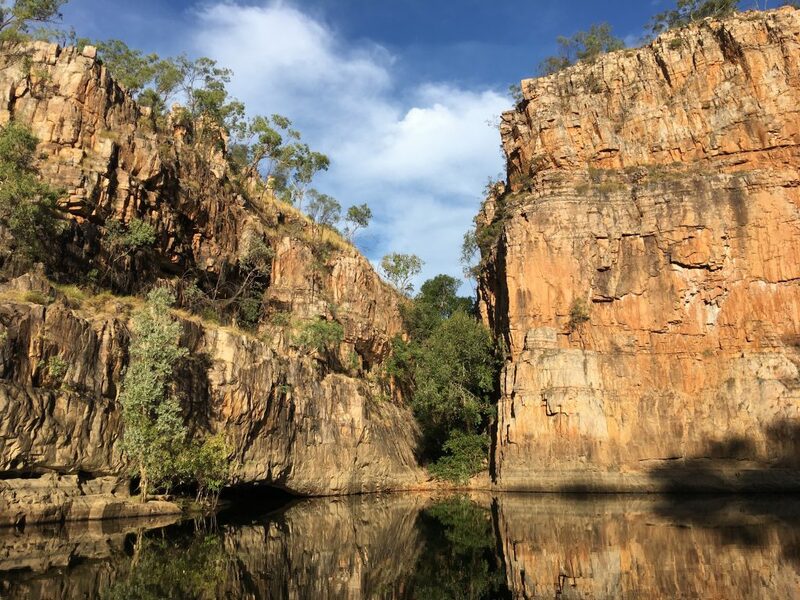 And while you don’t need a 4WD vehicle, having off-road access allows you to explore some of the more remote sites and most spectacular waterholes, particularly in Kakadu. For Davidson’s however, a 4WD vehicle is essential, unless you fly in. Indeed we’re forced to rearrange our plans when we discover that we have to cross the tidal East Alligator River, at Cahills Crossing, at 7am. Miss low tide and we’ll not only lose a day’s exploration at Davidson’s but we could become a saltwater crocodile’s breakfast. In the height of the Wet, this crossing is impassable for months. 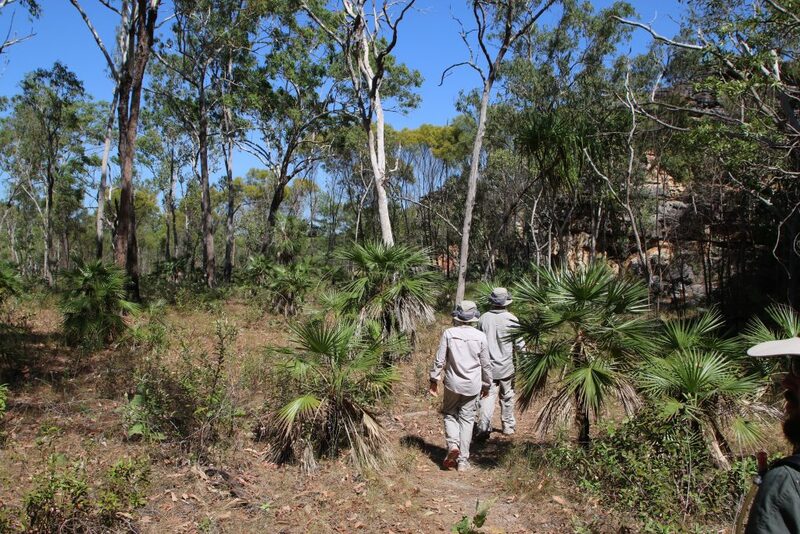 Davidson’s Arnhemland Safaris at Mt Borradaile is truly unique. The exclusively leased 700-square-kilometre wilderness is nestled against the Arnhem Land escarpment, its rugged ranges fringed by billabongs, flood plains, paper bark swamps and monsoonal rainforests. Its valleys and caves have been occupied for more than 50,000 years and offer magnificent galleries of rock art as well as occupation and burial sites. Davidson’s was set up by the late Max Davidson, who sadly died just two weeks before our visit. With the blessing of the senior traditional owner Charlie Mangulda, Davidson and his wife Philippa set up the camp and airstrip in the late 1980s, when the land was registered as an aboriginal sacred site. Locky pitches our safaris to appeal to the whole family. I could look at rock paintings all day, but my son Archie, 12, is more excited by finding “bush lolly shops” in the form of live green ants, which he plucks off trees and bushes and eats for a citrussy hit. My husband Simon goes crazy with the telephoto lens snapping brolga, jabiru, jacanas, sea eagles, snake-necked darters, bee-eaters, magpie geese and myriad other birds as well as sunsets better than any we’ve ever seen. We don’t need the long lens for the crocs. On one billabong boat trip we pull up at a rock shelf to alight, only to find a three-metre salty in the way. 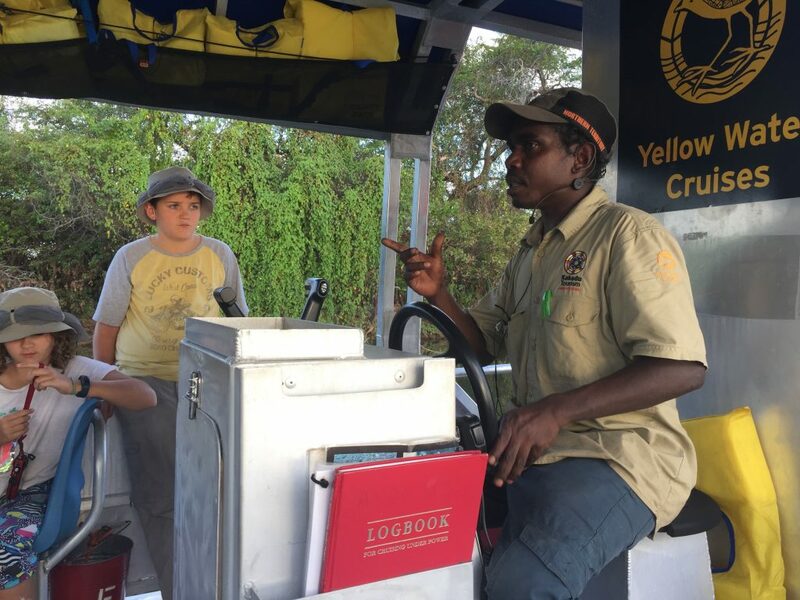 On our final evening Locky combines our sunset billabong cruise with a spot of unsuccessful barramundi fishing for which the camp is renowned. For me the rock art is the highlight however. The so-called Contact Gallery has relatively recent paintings of Macassan canoes, pearl luggers and masted sailing ships and drawings touched up with Reckitts blue, probably stolen from the washhouses of nearby missions in the early 20th century. Spectacular scenery, extraordinary wildlife, walking trails, gorges, waterfalls and waterholes are among Kakadu’s many drawcards. It’s a place that deserves to be explored slowly, where camping gives you the best chance experience its riches and enjoy nature in its purest form. The kids love the educational and interactive displays at each of the park’s visitor centres, and Lulu, 10, is quick to join in when she finds local women painting with other children in the shady grounds at Bowali. 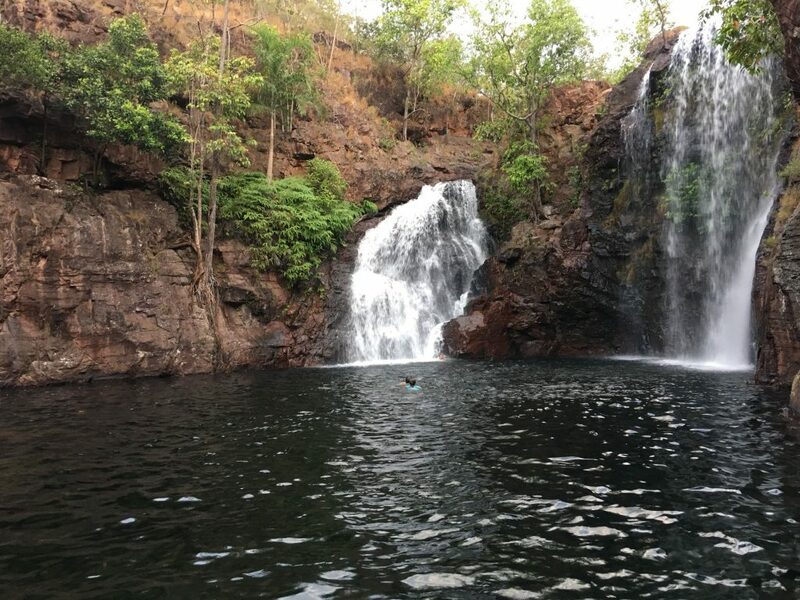 Water is the lifeblood of Kakadu, whether it’s isolated waterfalls and the swimming holes they spill into or billabongs and wetlands rich in flora and fauna. The largest of these is Yellow Water Billabong at Cooinda, roughly in the centre of the park, which is part of the South Alligator River system and accessed via Yellow Water Cruises. It’s not a cheap exercise – a two-hour cruise will set a family of four back $304 – but worth it for the abundant birdlife as well as the abundant saltwater crocs. 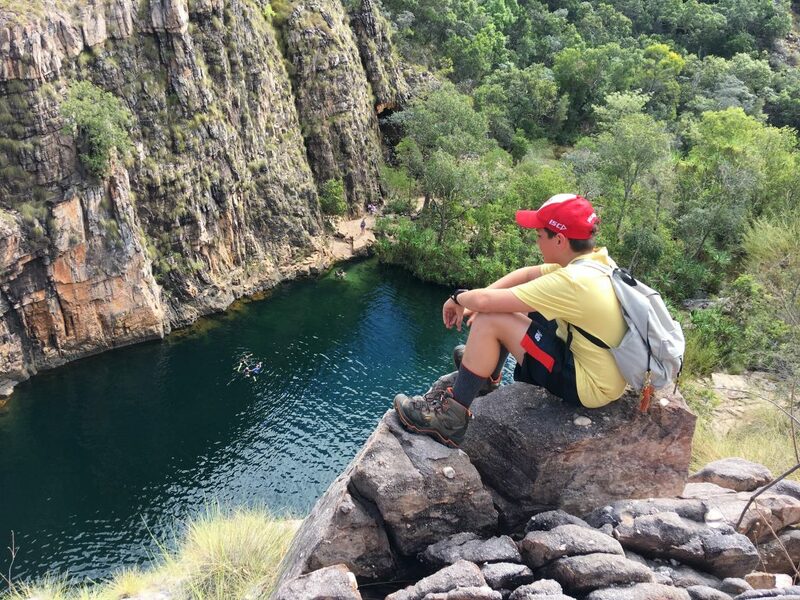 Kakadu’s waterholes are the biggest hit with our junior travellers, especially in the dry season heat, and any complaints about a lengthy uphill walk, climb or scramble to reach them are instantly quashed by diving into the crystal clear water. The “infinity pool” at Gunlom – you’ll have seen it in brochures or websites for Kakadu – is a treat but our favourite is Maguk, or Barramundi Gorge, where we swim in the vast plunge pool before climbing further still to the top of the waterfall where we’re rewarded, after more rock scrambling, with higher pools and gorges to swim through. Jim Jim Falls and Twin Falls are arguably the most famous waterfalls to visit but our car rental company won’t let us take our 4WD there as the road and its water crossings are deemed too dangerous and rough. 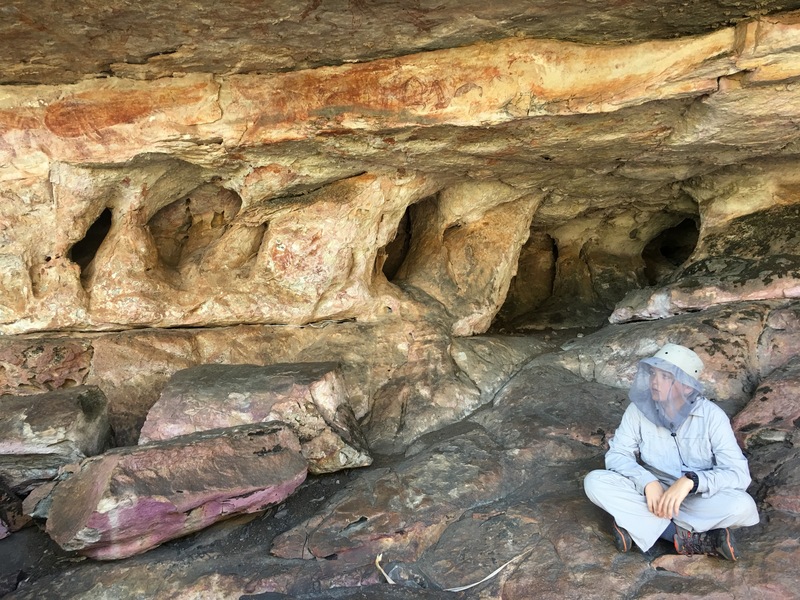 While the rock art at Kakadu – predominantly at Nourlangie and Ubirr – isn’t a patch on what we’ve seen at Davidson’s it is still significant. At Ubirr we join a free (and crowded) guided talk by one of the park rangers which interprets the images we’re seeing as well as the flora surrounding us, but we break away from the group as we’re keen to experience some of these paintings in relative solitude. A painting of a thylacine is a favourite. Tasmanian tigers were extinct from this part of mainland Australia 2000 years ago, which gives some indication of the age of the painting and others nearby. Ubirr is as famous for its sunset views as it is for its rock art. When we climb to the rock plateau for sunset we see the Nadab floodplain before us alight, one of many winter burn-offs we witness during our trip. A score of whistling kites is circling above, looking for rodents and reptiles escaping the smouldering earth and flames. We’re also treated to a concert. 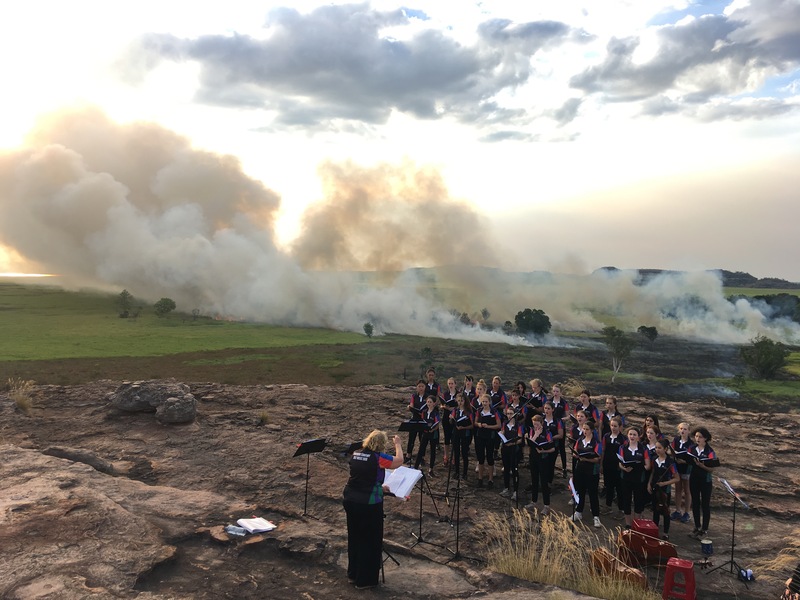 A choir and a handful of strings players from Santa Sabina College in Sydney are performing a small repertoire by Australian composers as part of their tour of the Northern Territory. The conductor looks familiar, and I realise it’s Karen Carey, who gained fame in a 2011 documentary, Mrs Carey’s Concert, about the music department at another Sydney girl’s school, MLC. Their singing and playing is as magical as the view. I’ve long been a fan of cultural immersion through hands on activities and our time in Katherine delivers it in spades. At first I’m sceptical about the Top Didj Cultural Experience just outside town, where a tin-shed gallery sells art from across the Territory as well as boomerangs made in Indonesia, as tame baby wallabies hop around the grounds. But when local Dalabon man Manuel starts talking about growing up in his country, about his language and family, about how he didn’t see a whitefella till he was about eight, we’re instantly mesmerised. He plays the didgeridoo, shows us how to make fire from rubbing two sticks together, and explains how to paint in the local Dalabon style. It seems cheesey – did we pay to learn colour by numbers? – but when we concentrate on creating our chosen totems using ochres and reeds, it’s like meditation. Kangaroo hunting using a woomera and a spear turns a fun afternoon into the “best day ever” for the kids. It isn’t over. For dinner we head to Marksie’s Stockman’s Camp Tucker Night, next door. Geoff Marks is an outback larrikin who has a way with words and can cook. Over two decades he’s spent extensive time with the local indigenous people and learned many of their culinary customs. While he spins his yarns we enjoy beef and crocodile sausage rolls with bush tomato and desert quandong sauce, wild barramundi with lemon myrtle and rainforest spice, and camel sausage with mountain pepper seasoning. And that’s just for starters. Beef is roasted with native pepperberry, bluebush and saltbush, roast potatoes are cooked with aniseed myrtle and peas are infused with native mint. It is all cooked in camp ovens over the coals, it’s all divine, and it’s a wonderful marriage of white and black culture. We wake early the next morning and head to Katherine’s principal attraction, Nitmiluk National Park and its extraordinary gorge. Thousands of flying foxes are settling down for the day as we walk down to the boat ramp, where we help ourselves to tea and muffins while we wait to board. The dawn cruise is the one to do; you’re the only boat on the water so you have the gorge all to yourself. Our guide, Jamie, is the best indigenous tourism worker we meet on the whole trip, and his interpretations of the geography, flora and fauna are superb. It’s a perfect example of what Australia needs more of – traditional owners sharing their country in an informative and knowledgeable way – and the standard that everyone should be working to achieve. As the rising sun casts its rosy glow over the sandstone cliffs, we see a plethora of birds including fairy martins swooping in and out of their nests and a pair of Australian hobbys, a long-winged falcon that is one of the fastest birds in the world. After the wild majesty of Kakadu, and even wilder Arnhemland, it feels like a bit of an anti-climax to visit Wangi Falls and have to share the waterhole with hundreds of others. Indeed my advice to anyone doing this route would be to visit Litchfield first so you build towards the wildness of Kakadu. We set out to escape the crowds on a 4WD only track to Tjaynera Falls but chicken out at a river crossing where the water’s almost 70cm high. Instead we head to the Lost City a bizarre cluster of weathered sandstone pillars surrounded by bush, and end our day with a swim at Florence Falls. At the cave at Davidson’s the hand prints talk to us of tradition and timelessness. The kids are fascinated, holding their own hands up over the ancient stencils to compare size and shape. I wonder how much they will remember, how many of the details they will retain, and if they understand how privileged they are to have seen them. Davidson’s Arnhemland Safaris costs $750/$600 adults/children per person per night including accommodation, all meals and safari activities but excluding flights, soft drinks and alcohol. Davidson’s organizes permits for travel into Arnhemland for guests. Mercure Crocodile Hotel in Jabiru, Kakadu, has family rooms from $319 per night. For a hotel with a four-star rating it’s a bit tired and dated and service leaves plenty to be desired. However the restaurant serves good meals and has a nice wine list. If you’re camping in Kakadu there are several large campsites and many smaller isolated campsites with basic facilities. Trade the convenience of a powered site with full facilities and pools for the tranquility of nature in bush campgrounds. Flash Camp at Cooinda Lodge, Kakadu is a fabulous way to have a bit of the Kakadu camping experience, with an extra bit of comfort. Spacious teepee-like tents are set up in a special area in the campground from June to September, and include a table and chairs, electric light and comfortable king-sized mattresses with linen on pallet bases. Guests has full access to campground facilities and pools. Doubles $149 per tent per night. The Cooinda Lodge campground has powered sites from $46. The Barra Bistro at Cooinda does terrific pub-style meals including arguably the best burger in the Territory. In Katherine Knotts Crossing is a campground filled with tropical plants as well as motel-like suites. They’ve seen better days but the position is good. Family suite from $145. Batchelor is the closest township to Litchfield National Park. The Batchelor Holiday Park has well equipped two-bedroom cabins for $261 as well as camping and caravan sites. While in Batchelor be sure to visit the Batchelor Butterfly Farm, which also has a quirky restaurant serving delicious food. An edited version of this article was first published in Traveller.